Surprise! I won another pig & $50 cash! 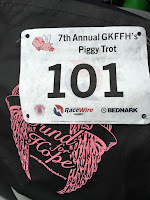 After dealing with an injury for the past 2 weeks, I was unsure if I would even make it to this year’s Piggy Trot. I didn’t want to do anything stupid this close to the Buffalo Half Marathon and I went back and forth all morning about what to do. My mom picked me up and dropped my dad off to hang out with Georgie. (Side note: It’s his birthday!!) My mom and I figured we would at least go down to Dowses Beach to get our numbers. The forecast was calling for race day rain and wind all week but a shift in the weather patterns just showed overcast. Just before the race, a misty rain started and it was pretty chilly by the water. Linda Lou and I had no desire to get out of the car at this point! I was thinking about walking with her but neither of us really wanted to walk. “Let’s just run and get it over with,” we said. 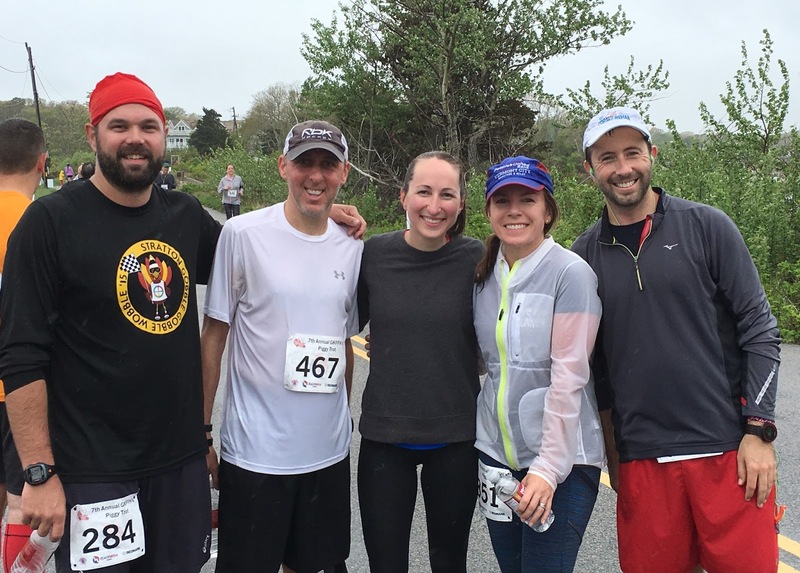 The race was the 7th annual Piggy Trot at Dowses Beach in Osterille, MA and my 6th time running. 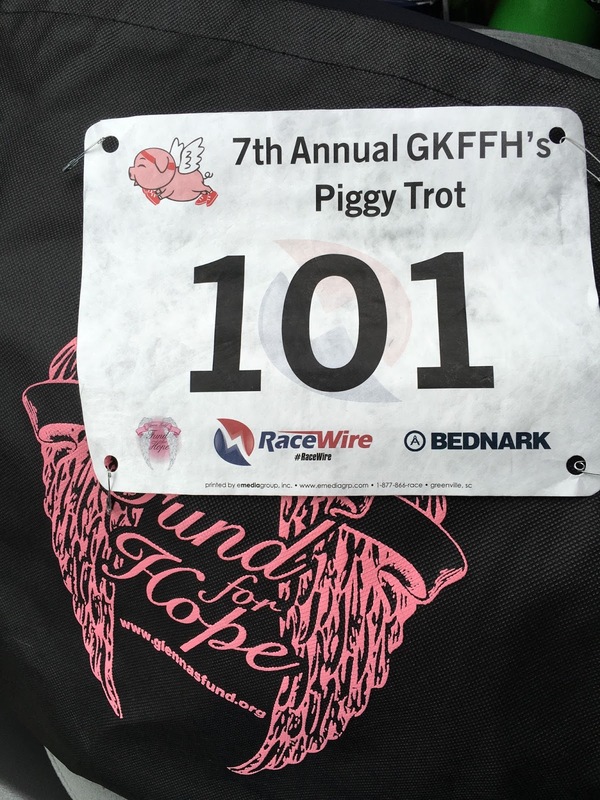 It’s a 3.7 mile road race raising money and melanoma awareness through The Glenna Kohl Fund for Hope. 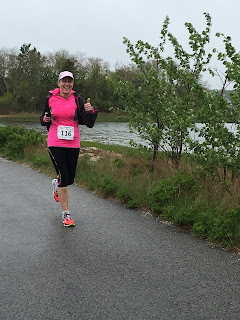 Although I never knew Glenna (nicknamed Piggy), she had ties to Cape Cod Rehab and we continue to sponsor and support her cause. I caught up with my Cape Cod Rehab team at the start. It was a small group this year—just me, Brian, and Eric along with Payton in the kids race! Brian began running the race with my mom and I decided I would run with Eric. I’ve been coaching Eric and his goal was to run under 27:00 (7:17 pace). He would keep me out of race mode but he was fast enough that I would still feel good running. (Running “slow” changes my stride and caused more pain on my leg.) If I was going to run, I wanted to run. Not race. Not jog. Eric and I went through the first two miles in 7:11 and 6:55 and overall I was feeling pretty good and relaxed. I had no idea where we were in terms of place but there was a girl in white just ahead of us that I told Eric we needed to catch by the end of the race. She was potentially in 3rd, which would me in 4th and totally within reach. Those pigs and cash prizes can really motivate you! Eric responded and we definitely picked up the pace. Mile 3 was in 6:46 but Eric was starting to breath pretty heavy. He fell back a little and I remember saying now is the time where we wish it was a 5k race and not 3.7 miles! Rounding the corner to the finish line, I looked behind me and tried to pull Eric back to finish strong in 24:55 (6:44 pace)! We crossed the finish line at the same time, well under his goal time and tied for 10th overall. I was 3rd female and Eric was 1st in his age group! My mom ended up running the first mile with Brian. They took a little walk break after the first mile then she cruised her way to the finish. She average just over 10 min/mile pace! She did awesome! Up next: Buffalo Half Marathon in Buffalo, NY on May 29th!